Installing is pretty simple. At least on machines which haven't already got a patch installed. The problem I found was super glue was used to glue the wires down, so removing the old patch caused damaged to the PCB tracks and pads. I was lucky and the PCB VIA's were still in place to solder to. If you are doing this update to a virgin Falcon, then you will need to remove 3 SMT resistors. R221,R222,R216. I would suggest just blobbing a huge blob of solder of the SMT resistor then you can GENTLY push it off the pads once all the solder has melted. Once all 3 SMT resistors are off, GENTLY clean the area with a IPA swab and check for pad damage under a magnifier. If you have damaged pads then I would suggest you abort the install as "trying to fit it" will likely destroy your falcon incurring a hefty repair bill! DISCLAIMER. Installing this patch along with removing the old patch is done entirely at your own risk. I do not accept any responsibility if you kill your falcon while doing these modifications. The buffer board comes assembled so you don't need to worry about soldering the SMT parts. I suggest you remove the U63 to make it easier to solder the patch board onto the IC. 0V marked on the PCB is pin 10 as shown in the above image. Then the diagonal pin 20 is the 5V pin marked on the PCB. Make double sure pin 1 of the IC is to the left as orientated in the above image. Getting this step wrong and soldering the buffer board on backwards is not a good idea, so check and check again! The PCB needs to sit flat ontop of the U68 IC. So solder as illustrated in the above image. TIP: I would suggest placing the 2 header pins in the buffer PCB and soldering them on the bottom of the PCB to hold them in place while soldering to the IC. I would also suggest as you likely need 3 hands to solder this, that you put a little solder on the IC pin and header pin, then you can hold the IC and PCB together in one hand and just heat up the 2 solder joins and melt them into 1. Then once held in place, solder the other pin and add a little more solder if needed. TIP2: Make sure the header pin is just long enough to overlap the wider top part of the IC legs. WARNING: DO NOT get solder on the narrower part of the IC pins which push into the socket. Only solder to the wider top half of the IC pins. 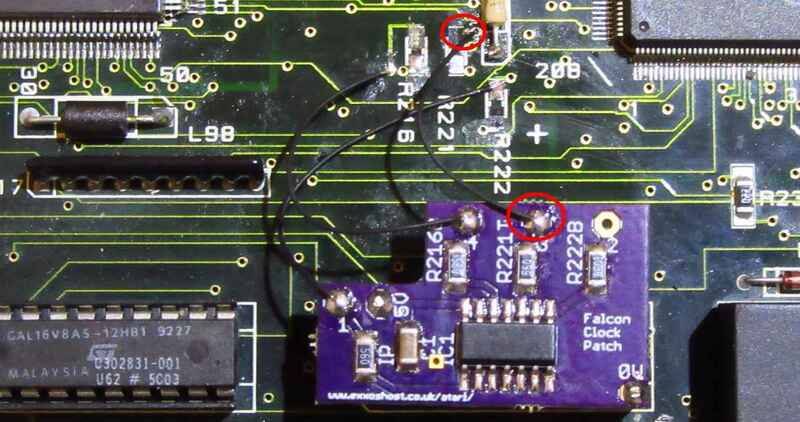 If you get solder on the part of the pin which pushes into the IC socket, then clean it off, otherwise you will likely damage the IC socket and the IC wont contact properly! (this would be very bad!) . WARNING: Double make sure you have not shorted out the IC pins next to where you are soldering the PCB header pins. NOTE: Its unlikely to be able to solder the PCB ontop of the IC perfectly straight. Trim the header pins and solder them on the top side of the PCB. Do not get the pins too hot otherwise it may melt the solder on the bottom side of the header pins and you likely will have to re-solder the bottom half of the pins again. Trim the tops of the pins once done. Place the U63 & buffer PCB back into the socket. The first wire is marked with 2 red circles. I supply a small length of wire so cut to size (as short as possible) and solder the wire as shown above. 2nd wire to solder on. 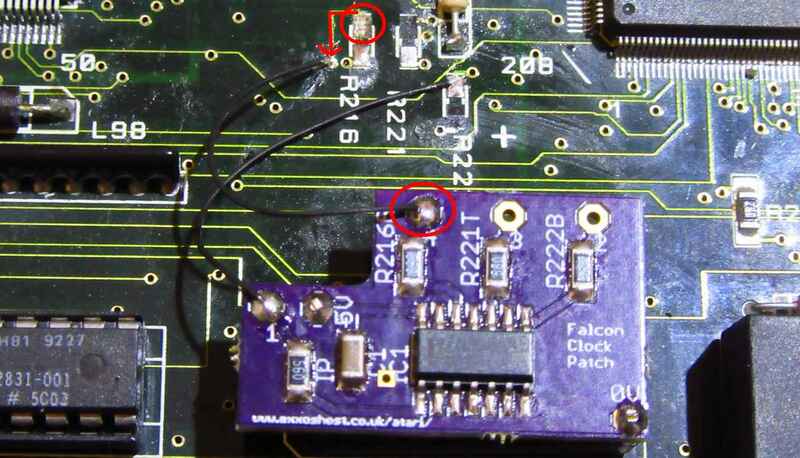 NOTE: I circled the PAD as this is where the wire is supposed to go, but due to pad damage I had to solder to the VIA, hence the red arrow showing where I actually soldered it to. NOTE: I circled the PAD as this is where the wire is supposed to go, but due to pad damage I had to solder to the VIA instead. 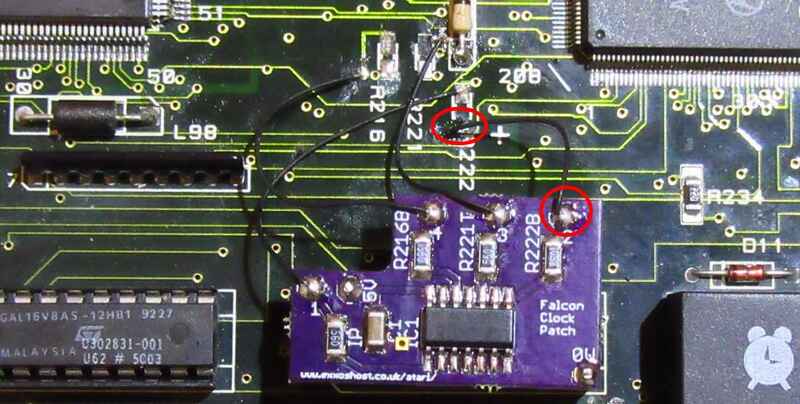 Images below show the Falcon clock patch as was fitted on my machine. This is needed on some machines which suffer from weak clock signals. The IC acts as a buffer for the clock signals. The IC used is generally a 74F04. According to Atari documents, SCSI can suffer and can also cause DSP sound related issues such as crackling. The original Atari mod can be found HERE Though it seems steinberg revised the mod somewhat since then which is basically listed below. 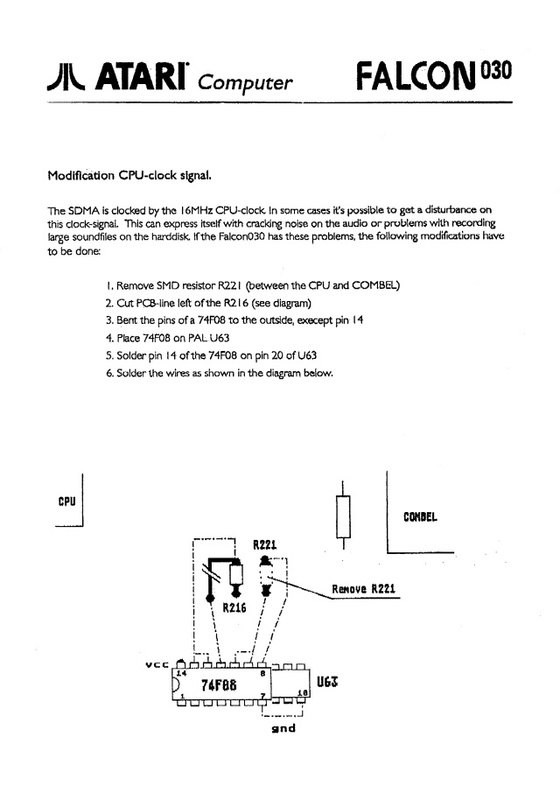 Since writing these instructions I have since found a 3rd method which uses buffer resistors. My tests as to why this mod is better is listed below HERE. I would also recommend a 100nF ceramic capacitor across the power rails of the F04 (not shown in images). I found there was some bad ringing on the Falcon clocks. 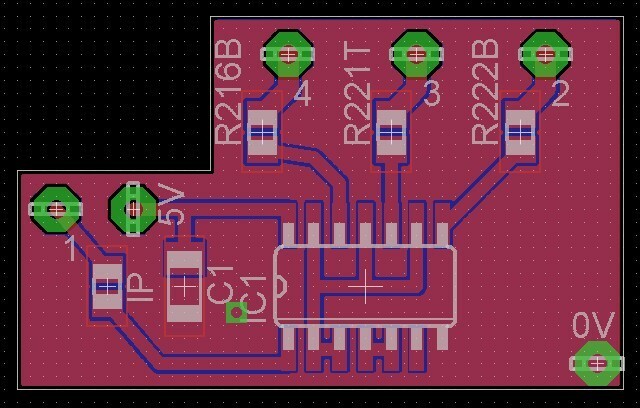 So I designed a small PCB which has some buffer resistors and also makes the upgrade a bit neater. If there is enough interest I will make up a small batch of these PCBs. I did not see "method 3" when I created by design. Though it seems steinberg recommended using buffer resistors. 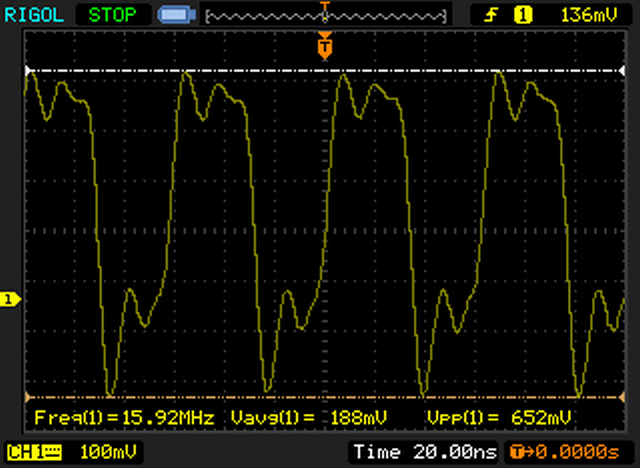 I added those onto my PCB anyway as I saw there is bad ringing on the clock signals. So this mod is a lot better than previous methods. Above is the test board in place. This version has a typo as R216B should have been R216T. Where T=TOP of the resistor and B=Bottom of the resistor on the falcons motherboard. As my falcon already had the patch done shown at the start of this page, I had to removed it. unfortunately it was death by superglue and the PCB pads came off :-( However its not a pad thing really as there as via's right next to the pads, which I think make a more secure connection to solder to anyway. 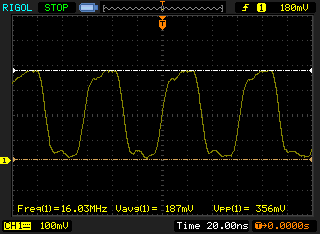 The middle scope image shows the Falcons default clock waveform, which also is the same as the output of the F04 without resistors. The second scope image on the right shows with the resistors added. As you can see the bottom of the waveform has almost 1volt of "bounce" and this is likely being seen by parts of the falcon's motherboard as a HI when it is in fact a LOW. Similar issues were riddled with the ST line aswell. Its clear Atari has some thoughts to add resistors on the motherboard to start with, but didn't quite get there into having stable clocks. The "Blue Edition" Version 2 fits the same as the previous V1 (purple) board. 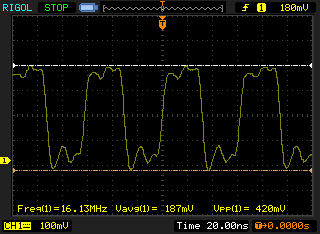 Version 2 solves a poor logic low level on the SDMA clock line. This may help with bus speeders such as Phantom, but as I have no means to test.